What your grandparents would have though of as science fiction is now a reality – the robotic lawnmower. Mowers have come such a long way in a few short years. For example, if you want a maintenance-free mowing experience for mid-sized lawns, today’s robotic electric lawn mowers are an excellent option. Here is a comparison table showing the most popular robotic lawn mowers currently being sold on Amazon in the UK. Click here if you want to read our “Robotic Lawn Mower Buyers Guide” before browsing the top 10 list. Lawn mowers have come such a long way in a few short years. 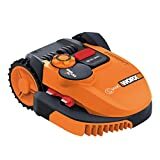 For example the newer battery powered lawnmowers as well as not having the noise and hassle of petrol mowers they also beat their electric corded lawnmower cousins by not being limited by their proximity to a power source. But if you want to go even further, there’s more advanced lawn mower tech to explore, and at the cutting edge are robotic lawn mowers. These machines are designed to mow small lawns automatically (a little bit like dangerous Roombas). They come with a high price tag and require a little garden modification, but if these hands-free lawn mowers interest you, we have a list of the top 10 models available. Check it out! This Husqvarna mower has a compact, sturdy design and can cut up to 1,500 m² (1/3 of an acre) of grass on its charge, with an impressive slope rating of 40% – steeper than the majority of robot mowers can handle. It also has a handy theft detection code/alarm setup. This is a newer feature that robotic mowers are starting to adopt, which helps stop people from just picking them up from gardens and running away with them. Speaking of picking the mower up, there is a lift sensor that stops the blades if someone tries it, along with “bump” sensors that will automatically turn the mower around and automatic charging. You can program in your own settings for schedules as well! Note that, like almost all robotic mowers, this is a mulching mower only, so clippings will fall back into the lawn instead of being gathered up. Also, keep in mind that the price is only for the base model mower. However, most people will also need to purchase an install kit (there are several bundled options for different garden sizes). The install kit lets you set up boundary wire around your lawn to control where the mower operates. 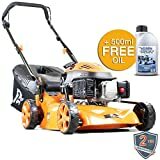 It’s a little clunky, but it’s currently the best way to control the mower, and an additional price you have to pay for the automatic version. This simple yet effective Gardena mower can mow up to 800 m² and offers automatic recharging, plus an installation lock/alarm to prevent theft. It also has waterproofing that allows the mower to work in light rain – although of course, this won’t be as good for your lawn. Programming options include mowing times but not much else. Cutting height adjusts with a simple twist of a knob, up to two inches high (about average for robot mowers, and good for keeping lawns short). The three blades only have around a 17 cm cutting width, so this mower will take its time – it’s designed for smaller gardens only. Robomow, a popular brand in the robot mower world, offers this sturdy model that’s suitable for up to 1200 m² and slopes up to 36%. It has a cutting width of 28cm (11”) and a range of cutting heights of 15 to 60mm. The floating deck means that the robotic mower adjusts to cut the gentle contours of your lawn. In addition to alarm codes, the mower has a couple unique smart features. The first is a patented driving system that aims to keep the mower as nimble as possible, while the second will automatically return the mower to its shelter if it starts raining – it is not good for your lawn to mow it whilst it’s raining. Finally, you can control the mower via a smartphone app, a handy smart feature that allows you to customize mowing times! Worx’s robotic lawn mower, designed for lawns up to 1500 m², is very clever. 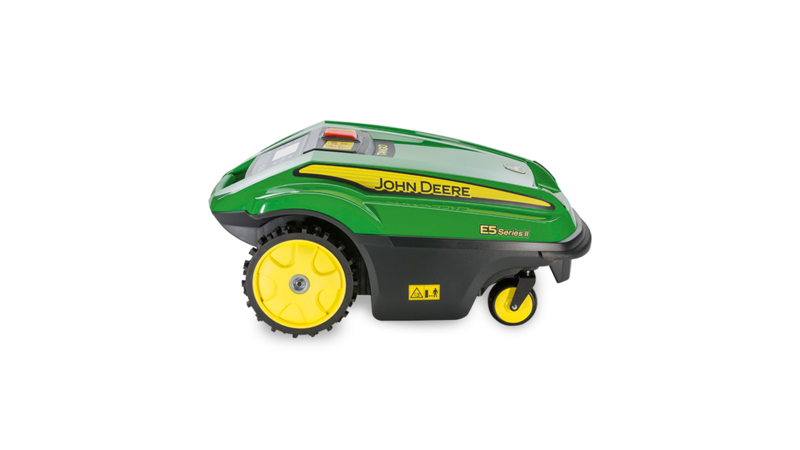 It automatically returns to its base for recharge or to get out of the rain, and has a shock sensor system to mow around larger obstacles when necessary. Sensor technology also allows it to track narrow strips of lawn when needed. It can mow slopes up to 36%, and the sophisticated electronics on board the landroid allow the robotic mower to calculate drift, inclination and other parameters in order to ensure an even mowing of even the most uneven landscapes. Note that Worx also offers periodic software updates, so don’t forget to connect this one to your Wi-Fi network via the keyboard, which also customizes your mowing schedule. The second Robomow model on our list is actually a more powerful version of the first one. Most features, like the broad cutting with, the 36% slop rating, smartphone compatibility, and anti-theft features are all included. However, this mower has a bit of extra power that makes it suitable for gardens of up to 3000 m², one of the best ratings around. This sleek McCulloch model, rated for up to 1000 m², can handle slopes up to 25%. It has a few basic safety features, including automatic stop when the mower is lifted and anti-theft alarms, but the ROB isn’t big on extra features. It’s mostly just a solid robot mower that’s designed to do a solid job with minimal fuss and easy programming. Cutting heights stop at 5 cm, so this is another robotic lawn mower that isn’t quite suited for taller grass species. This version of the Miimo includes 360-degree sensors, options for three different cutting patterns, and a slope rating of 25 degrees. It also includes a season timer so the mower can automatically adapt to different seasons. Common features like anti-theft measures, schedule programming, and height adjustments (up to 2.4 inches) are also included. You can see how this mower has particularly advanced features for intelligent mowing! 4 Ocean’s model is an affordable robotic lawn mower that’s equipped with the basics. Rain sensors, bump sensors, scheduling, anti-theft codes – it’s all here. The mowing width is 12 inches, which is better than the smallest robot mowers but still only really suitable for small gardens. One unique feature is the LCD screen, which is equipped to display emergency codes if the mower senses that anything is wrong, providing a bit of self-diagnosis. This Robomow model is the most affordable robotic lawn mower on our list, and ideal if you would like to save as much money as possible. However, it’s designed for only small patches of lawn around 200 square metres, and can only handle slopes of around 15%. The blade width is only 18 cm. 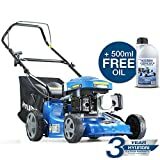 This mower is ideal if you have a home in town with a small, smooth garden that nevertheless needs to be kept neat and tidy. This excellent John Deere mower is equipped with the latest features and has received great reviews. It comes with a wayfinding mode that mows in a random pattern but keeping note of the spots it hasn’t mown yet, so you don’t need to worry about creating patterns in your lawn (with an additional spiral option if you want). Anti-theft codes and bump sensors are also included, along with an excellent onboard control system for scheduling. It’s a hard model to beat…when you can get your hands on it. Think About the Parameter Wire: Robotic lawn mowers require a parameter of wire along the edge of your lawn. The mowers sense this wire and treat it like an obstacle, keeping them on track. The good news is that this wire is typically designed to be buried a few centimeters underground, so it doesn’t present a tripping hazard. The bad news is that it can be time-consuming to install for larger gardens, and requires precise placement to ensure that the mower reaches the edges of your lawn. You can arrange for a professional installation of this wire, although of course that adds to the bill. How often should I mow my lawn with a robotic lawn mower? Automatic robotic lawn mowers are designed to mow about once a day. This is important to remember for couple different reasons. First, daily mowing is necessary so that the grass clippings act as mulch and don’t make unsightly piles – if you mow everyday then the clippings are tiny and almost unrecognisable. Second, robotic lawn mowers aren’t really made to mow tall, thick grass every time, so delaying your mowing sessions can harm the mower and lessen its effectiveness. When you look at programming options, remember these lawn mowers are meant to be used every one or two days. 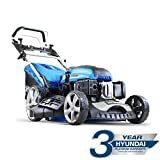 What cutting width should I get for my robotic lawn mower? Robotic lawn mowers vary tremendously in cutting width, so pay attention to how much surface those blades cover. Mowers that only cover 20 centimetres or under are primarily designed for only small patches of lawn – or they’ll have to work very hard to mow larger gardens, which will reduce lifespan. What does the “slope rating” mean on robotic lawn mowers? Those slope ratings are no joke. If the lawn mower tries to tackle a slope that’s too high for it, then even if it makes it it will likely get thrown off track and mess up the mowing program . It’s all right if you don’t know the slopes gradients of your garden off the top of your head, but you should still go check before choosing a mower. Sometimes lawn mower slope ratings are given in degrees, but they are often rated as a percentage. This is another vital rating when checking for compatible robotic lawn mowers! It’s okay if you aren’t sure of your acreage, especially if you have less than an acre of lawn (which is the size where robot mowers are intended to be used). The easiest way to check your acreage is to take a look at the plat map. If you have the title documents from when you bought your home, there’s usually a copy of the map somewhere inside. Otherwise, there are other ways you can eyeball and calculate acreage.